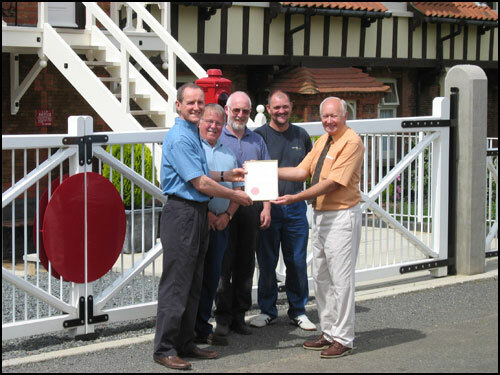 (L to R) Richard Brown receiving the Mayors Award in 2004.
so, a station did require. a station built just for his ease. built well and strong but not with haste. and hunting parties there did hold. both well furnished, calm inside. and a stream of aristocrats it got. have waited here the train to board. all arrived here on the train. and back to London sent quite sharp. and came each Christmas for a spell. was the last royal by the station seen. this treasure of the English nation. like most of us, a monarchist fan. but this was not for long to be. who, restored its look, removed its frown. paths are swept and windows shine. and show respect we all must. God Bless this place, our Royal Station.